Four top-flight teams, three of them against lower-league opponents, reached the semi-finals of the RBS MacTavish Cup, shinty's North area championship. The only all-Premiership tie was at Balmacara where a last-minute goal from Finlay MacRae gave Kinlochshiel a 3-2 victory over Kingussie. In the Premiership versus National Division encounters, holders Lovat beat Kilmallie 5-2 in Kiltarlity. Newtonmore defeat unfancied Beauly 3-0 and Glenurquhart edged Caberfeidh 2-0. Kyles, holders of the AJG Parcels Celtic Society Cup, thrashed Taynuilt 11-0 away from home in a near carbon copy of last season's 12-1 scoreline at the same quarter-final stage. At Balmacara, MacRae opened for Kinlochshiel and Alasdair Nixon made it 2-0 before Fraser Munro and Thomas Borthwick struck back for Kingussie in advance of MacRae's last-gasp winner. Greg Matheson got Lovat's opener and Liam MacDonald soon levelled for Kilmallie. However, Matheson completed his hat trick and Graeme MacMillan and Kevin Bartlett put it in the bag for Lovat before a late penalty from MacDonald. It was goalless between Newtonmore and Beauly for 70 minutes at The Eilan before John MacKenzie, Evan Menzies and Jamie Robinson clinched it for the top-division side. And a David Smart second-half double sealed it for Glenurquhart against Caberfeidh in Drumnadrochit. Kyles' 11 goals at Taynuilt included a David Zavaroni hat-trick and two each from Dunky Kerr, Roberto Zavaroni and Rupert Williamson. 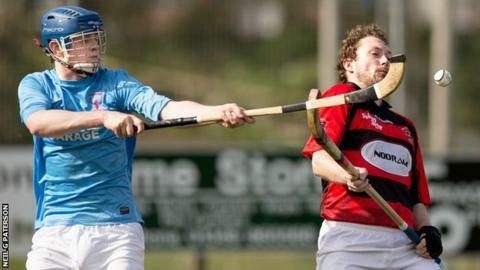 The Celtic Society quarter finals also included an Oban derby which ended 5-0 for Camanachd over Celtic. Gus Campbell opened the scoring, Connor Howe added two and Malcolm Clark contributed two more late on. A Euan McMurdo hat-trick helped Inveraray to a 5-0 success at Kilmory and the other goals came from Chris Crawford and Grant Griffin. Craig Anderson got the only goal of the game to book the remaining semi-final place for Glasgow Mid Argyll at home to Glenorchy. In the new MacTavish Plate competition, Fort William beat Strathglass 7-0 in Cannich with Arran MacPhee on target four times. A Will Cowie extra-time goal gave Skye a 3-2 home win over Lochaber in the same competition. The only Balliemore Cup tie of the day ended 3-1 for Aberdeen University away to Lochcarron.